Old Town Alexandria's new development Robinson Landing will feature two new restaurants, as well as ritzy condos and townhomes. 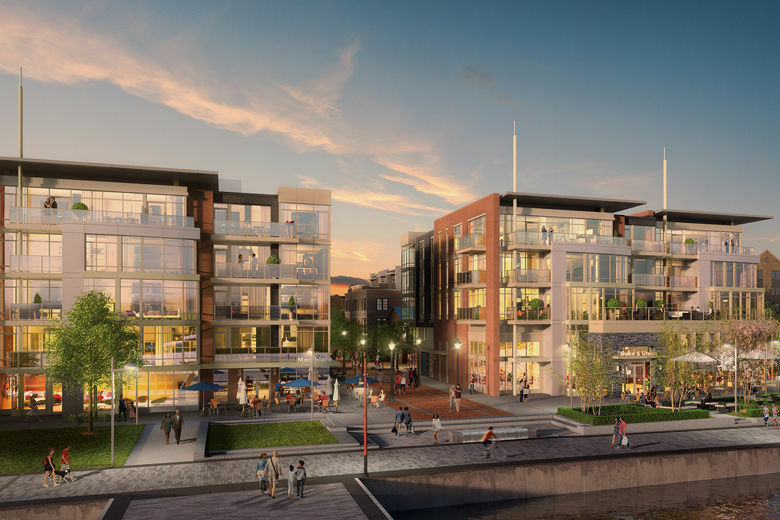 Alexandria Restaurant Partners’ plans for two restaurants at Old Town’s new Robinson Landing development have won approval from the Alexandria City Council, joining multi-million dollar condos and a revitalized waterfront in the Virginia City. The council has authorized special use permits for the restaurant group to open a 5,000-square-foot fine dining restaurant on the ground floor of one condominium building currently under construction at Duke Street and The Strand along the new waterfront promenade. The as yet unnamed restaurant will have a patio and will serve what Alexandria Restaurant Partners partner Scott Shaw describes as a chef-driven menu with a wood-fired kitchen serving grilled seafood, steaks, vegetarian dishes and an extensive wine list. The second, also yet-unnamed restaurant, will be a casual Mediterranean restaurant in a second condo building under construction next door with a 232-seat outdoor patio on Robinson Landing’s renovated pier. It will feature small and shared plates from Spain, Turkey and Greece. When completed, Robinson Landing will include a total of 70 condos in three buildings, selling for $1.5 million to as much as $5.5 million, and 26 townhouses. Fifteen of the townhouses, which were completed last fall, have already been sold or reserved. They range in price from $1.7 million to $2.3 million. Other additions at the pier will include docks for transient boaters and space for public outdoor entertainment. When completed in 2020, in addition to the homes and condos, Robinson Landing will include a waterfront promenade and a revitalized pier. Robinson Landing is a joint venture by developer EYA, JBG Fund IX, a fund managed by JBG Smith, and Mitsui Fudosan America. Alexandria Restaurant Partners already runs a half dozen other local restaurants, including Lena’s Wood-Fired Pizza & Tap, The Majestic, Vola’s Dockside Grill and Theismann’s, all in Old Town, as well as Palette 22 in near Arlington County’s Shirlington neighborhood. The company has an existing restaurant in Orlando and another opening there soon.